85 C E L E B R A T I N G Y E A R S MAKES [ ] EASY. 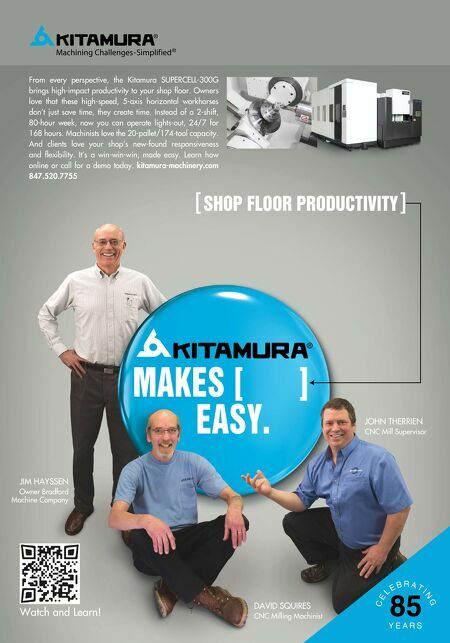 [ SHOP FLOOR PRODUCTIVITY ] JOHN THERRIEN CNC Mill Supervisor DAVID SQUIRES CNC Milling Machinist JIM HAYSSEN Owner Bradford Machine Company From every perspective, the Kitamura SUPERCELL-300G brings high-impact productivity to your shop floor. Owners love that these high-speed, 5-axis horizontal workhorses don't just save time, they create time. Instead of a 2-shift, 80-hour week, now you can operate lights-out, 24/7 for 168 hours. Machinists love the 20-pallet/174-tool capacity. And clients love your shop's new-found responsiveness and flexibility. It's a win-win-win, made easy. Learn how online or call for a demo today. kitamura-machinery.com 847.520.7755 Watch and Learn!